Four years ago today, I sat up late writing what would become the first outline of Never Been to Graceland. The first outline was much zanier. Instead of a long-lost song, the MacGuffin was a long-lost Elvis film that had been canned under the orders of Colonel Parker. Michael, traveling cross-country to see the film “because he’s seen every Elvis movie and has to see the last one,” ran across a deluded fan who claimed to be the daughter of Elvis and Ann-Margret, a biker gang, a mega-rich collector of rock and roll memorabilia, and a duo of bumbling private investigators hired by AJ’s parents to find her when she stows away in the back of Michael’s truck (unbeknownst to him.) Oh, did I forget to mention? AJ, now a reporter, in the early drafts was a teenager on the run and in its earliest incarnations, “Graceland” attempted to blend the silliness of Willy Wonka and It’s a Mad Mad Mad Mad Mad World with echoes of the grounded, on-the-road cinematic sensibility of Terence Malick’s “Badlands”… all under the umbrella of a celebration of the phenomenon that is the fandom of Elvis Presley. Four years ago today, I was still smack in the middle of editing The Incredible Search for Jamie Klotz’s Diary, trying desperately to prove that I could make a movie, period, let alone a good one or coherent one. I had announced Graceland at the premiere of Jamie Klotz’s Diary. It was my “end goal.” Knowing how long and how many failed projects it took before I got to Jamie Klotz, I have to confess I honestly don’t know if I ever thought I’d really actually make Graceland. If I was going to follow this dream, why not shoot as far as I could imagine? A few days ago I sat down and watched Jamie Klotz’s Diary for the first time in about a year. Whenever I have a new project that’s about to be released, I always end up watching old projects to just reflect. I’d forgotten how funny that movie was, but also, too, how endearing its low-budget workarounds were. I still saw so many things I wish I could just back go in and fix – visual effects, camera moves, sound quirks. Then I switched over and watched Graceland one more time, looking for any possible reason to make any last minute changes or fixes. I couldn’t find one. It is literally as good as it is going to get. Short of re-shooting, I couldn’t fix anything else… and I wouldn’t want to anyway. So here I am, trying to savor every moment of this, because I don’t know when the next one will be, or if there WILL be a “next one.” I’ve got ideas, some of which I might even talk about at the premieres during the Q&A, but I’m not committed to anything. I’m going to spend a lot of time next week thanking people. I mean every word of it, and if I forget anyone, I’m incredibly sorry. This has been an amazing four years and it couldn’t have been done without help. My only hope now is that it resonates with the right people. 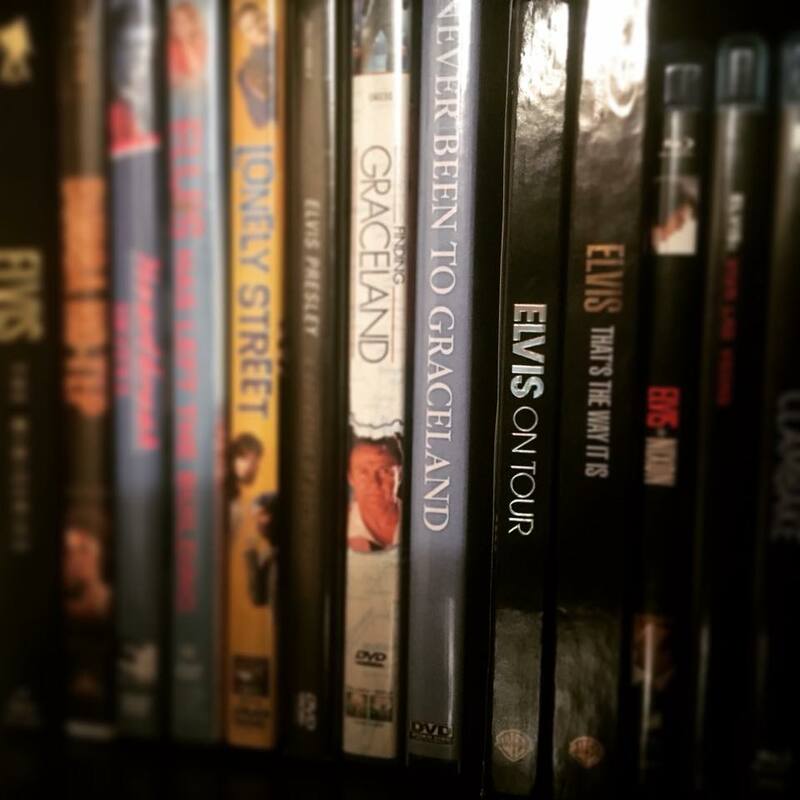 I have a shelf at home on which I have every single one of Elvis’ movies, from Love Me Tender to Change of Habit, plus the documentaries, TV specials, and a good number of Elvis-related movies that don’t star the man himself; Well known stuff like Walk the Line and Elvis & Nixon alongside more obscure stuff like Lonely Street and Elvis Has Left the Building. Now I’ve gotta make room on that shelf for Never Been to Graceland. Okay, I’ll own it. Jamie Klotz’s Diary II isn’t a particularly good movie. It always lacked the sort of freewheeling spirit of the first one. It’s more downbeat and feels smaller in scale, it has some pretty glaring technical issues, and the plot is neither funny or interesting enough to offset the other shortcomings. Rather than break down the whole making-of day-by-day in the vein of past “Jamie Klotz’s Origins,” I’d just like to reflect briefly (briefly – ha!) overall on those shortcomings and why I decided to create a “Director’s Cut” that no one asked for. 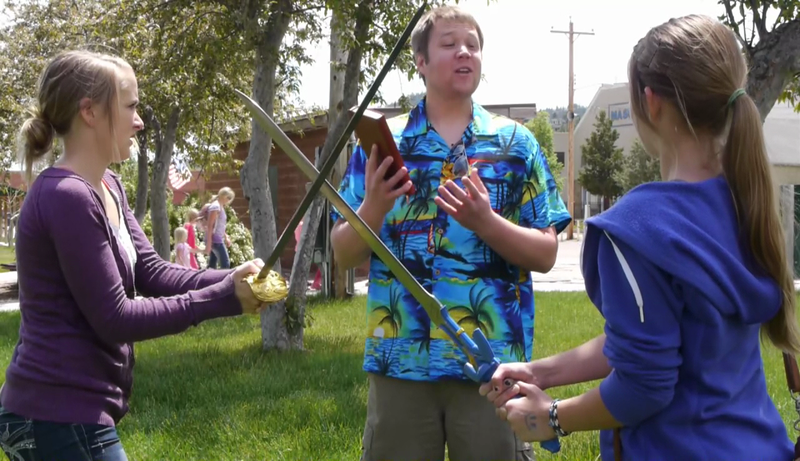 Top: Actual shot from original JKD2. Bottom: From the Director’s Cut. Of all the things to talk about, this is probably… well if not necessarily the most obvious, at least the easiest for me to talk about. From the moment JKD2 starts, it just looks visually dissimilar to the first one. The colors are flat, almost desaturated – forget color grading, there’s hardly any color at all. The entire film looks like the life was sucked out of it. Well, I’ll be honest, that’s because I didn’t bother to grade it in the first place. After a bumpy production in which I struggled just to get people together to shoot (not a new problem, if you look into past blogs), post-production was practically non-existent. No fingers need to be pointed, I’ll take the fall on all of this – I failed as a director and as a leader. I failed to coordinate and I failed to inspire. I failed to set the proper tone in the script, on the set and on the production overall. 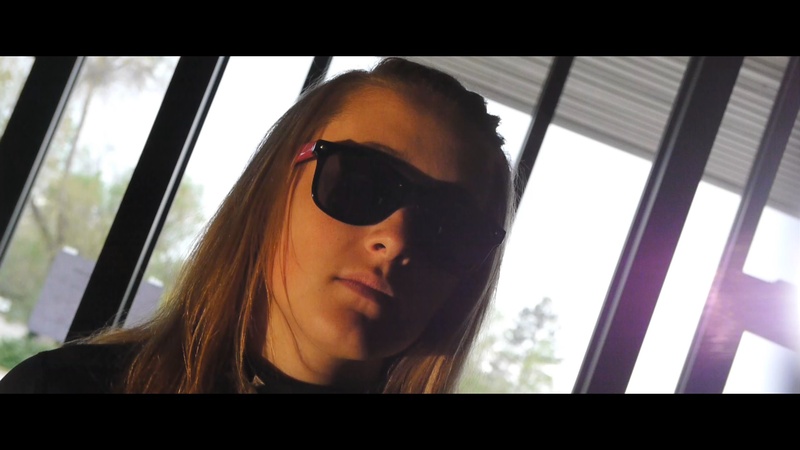 We began filming in earnest in April 2014, a little over 6 months from the premiere of the first Jamie Klotz movie, which was shot essentially in four days. We didn’t finish shooting JKD2 until August. We shot nothing in June and almost nothing between July and August. Not in the original script, but Aspen still did a great job with this. The entire scope of the film shifted as a result of scheduling, the weather, and my own limitations as a director. A “post-apocalyptic future” scene was hastily written the morning of a rainy shoot day. That “future” section took place in an unconvincing – but indoors! – civic center (complete with modern cars rolling by outside). The preceding scene, where Jamie and PJ first meet each other, was originally part of a subplot involving Jamie’s mom. That was scrapped and ultimately replaced with a scene at Cascade Springs – again, written mere days before the shoot for said scene. An entire cast member was replaced (the girl who played Rachel originally moved away mid-shoot). The final scene involving The Man (in centrally located Centennial Park) despite being written as jokingly anti-climactic, looked visually uninteresting, and was still marred by passersby (one hilarious outtake has a group of school kids walking into the public restrooms behind Aspen and Yona’s clashed swords) and rapidly changing summer weather, with looming, dark cumulus clouds in the background of several shots which also contributed to horrible visual inconsistency in natural lighting. Even in early editing, something about the film felt “off.” Despite a plot that spanned across dimensions and time, the story felt small and constrained. My direction on set had been constrained as well – “stick to the script, this is a complex film” and “Let’s not move the camera so much, let’s keep it on the tripod.” Every smaller decision, whether a reaction to an uncontrolled variable like weather or a deliberate choice like camera movement, led to an overall sense of shrinking scope. JKD was a rollicking carefree adventure sprawled all over Hot Springs. JKD2 was a muted, precise sci-fi story, with specific plot points, locations and serviceable but not necessarily inspired visuals. Jamie Klotz’s Diary II felt very unlike Jamie Klotz’s Diary, and at the time I couldn’t place my finger on why. Like I said, by the end of shooting, we were happy to be done… except that we weren’t. Every project I work on is an experiment of some sort. Some experiments are better suited to disposable shorts that are low-stakes. JKD1 had a lot of experimental elements for me, particularly with special effects, to a varying degree of success. Some, like Sahera’s attack on Dorn, turned out great. Others, like Dr. Lawrence’s 2D transition effect, fell flat (pun absolutely intended!) But in all of those cases, I was never working with anything more than what I had throughout the whole film. I was never introducing something new each time we shot. 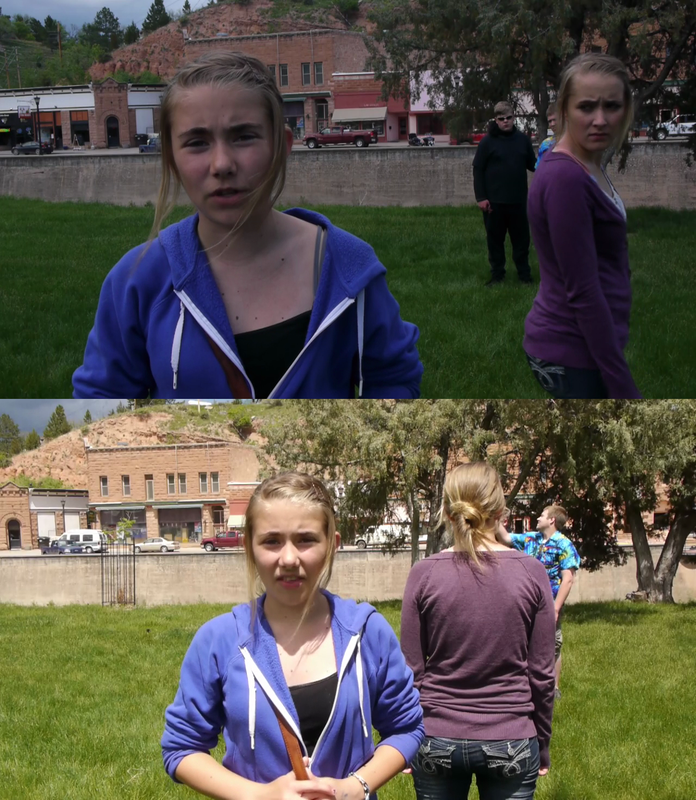 The first two days of filming JKD2 in April, I had a boom mic that we had plugged directly into our camera. To my dismay, I later learned it was only capturing mono audio, on the left channel. The rain on the metal roof on the civic center led to incomprehensible dialogue inside, and an entire animated sequence (similar to The Man’s Sahera story from JKD1) was scrapped due to incomplete narration that was missed on set. Dialogue replacement recordings did not happen at all due to my failure to properly coordinate and lead. By our May shoots, I had brought in another camera to use, but one camera was shooting at 30fps and another at 24fps – a horror during editing that would leave some of the footage looking crisp and the rest jagged, or some looking smooth and the rest blurry. I kept adding new elements and equipment all throughout the shoot, not only to experiment with them, but also to continually improve the film – if the audio in one part of the film was in mono and muffled, at least it wouldn’t be in the rest of it! The end result, however, was nothing but inconsistency, across the board. Actual shot from original JKD2. Note Brandon’s cut off shoe. The film was left untouched on my hard drive from August until mid-December. There was just too much work to do to fix everything. Finally the weekend before Christmas I sat down and just worked at the film until it was in a “complete” state, at least watchable from beginning to end. I kept trying to work on pieces of it throughout the winter, even asking for Ryan Brewer’s guidance on how best to go about fixing a missing shot (ultimately I just cut around it to leave it out). 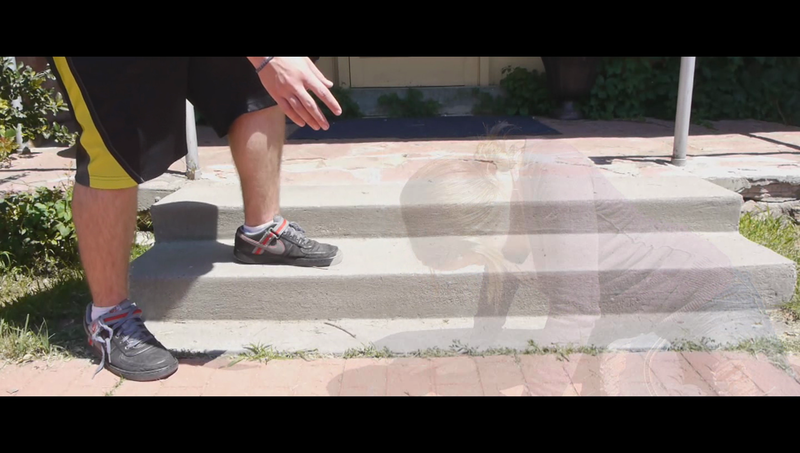 When I finally rendered it out in March 2015 there were still incomplete visual effects (see Brandon’s disappearing toes when Jamie begins fading from existence the first time), the sound mix was rough, I had dropped the composer I had had lined up when my aspirations for the project were still high, and I could not be bothered to color grade it. I was just ready to premiere it to get the weight of the project off. After we premiered the film in May 2015, I directed all of my attention toward Never Been to Graceland, ready to put Jamie Klotz’s Diary behind me. I had announced it at the JKD1 premiere in 2013 and had been putting it off to try to get the script right. Graceland would be a feature length film and we did a Kickstarter that summer. Two problems. The Kickstarter flopped, and the script for Graceland at that time sucked. Thankfully some writer friends didn’t mince their words toward that end, but between that and JKD… talk about having my tail tucked between my legs. I sort of resolved that maybe I just had one movie in me, and that JKD1 was a lucky fluke – I couldn’t even argue that JKD2 was at least technically a “movie” in that that ran at 24fps and had sound – after all, the mixed frame rates left the movie looking choppy and the sound wasn’t particularly well-mixed! I don’t know what it was about The Christmas Heist, but it flicked this switch in me. I suddenly felt like filming again, and I hadn’t even necessarily known up till then that I had sort of subconsciously put myself into a mindset of being “done” with movies. The missing line “Kaitlyn? I am having some serious deja vu.” from this shot is barely audible in the original cut, which used the camera’s audio. In the Director’s Cut, I was thankfully about to find the boom mic’s track. In the aftermath of the show, I found myself in a situation a lot like the one I’m in now, sort of unsure about where I want to go creatively, but very much energized. I found myself watching the Jamie Klotz Duology one evening, and after they were done, I realized the film wasn’t finished. The DVDs had all gone out to everyone in the cast, their families, my friends, it was up online… but it wasn’t done. It wasn’t as good as it could have been and no matter how good or bad the film was in the end, I wouldn’t be content with myself if I didn’t fix it, even if I was the only one who ever saw the final cut of the film. I re-edited the film, not entirely from scratch, but several sequences were. I color graded the whole film and did as much as I could to at visually align it with the first JKD film. I adjusted settings to mitigate the frame rate issues, reworked the sound, including adding score to some scenes which had not had any before, as well as rescuing a line of dialogue that I had thought was lost, and I even added two new sequences, one “rewind” of the film when Jamie travels back into the past the first time and an audio hallucination that Jamie has toward the start of the third act that more explicitly ties story elements hinted at in JKD2 to the plot of the first film and the potential plot of JKD3 (which I still had not entirely ruled out but was admittedly increasingly less likely). Despite no one else knowing about it or asking for it, I had to give JKD2 a second chance, for my own sake. 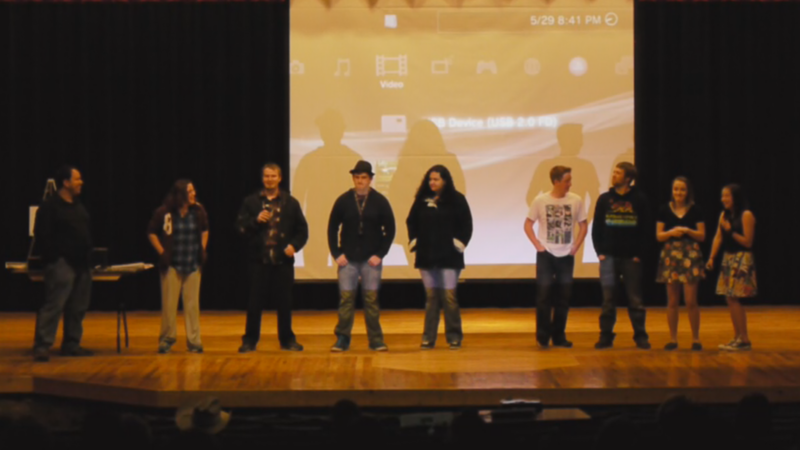 At the Mini Film Fest that April, I did the first and only screening of the Director’s Cut, alongside the short “The Black Owl,” which had also been left unedited in the aftermath of JKD2. For over a year, no one else has seen this cut of the film. I toyed with putting it online a few times over the past year, but always decided against it. I don’t know what changed my mind now. Maybe that since Graceland and I Sent My Grandma Into The Past have gone well so far, I am comfortable with what this movie is. Yes, it’s not a particularly good movie. I can recognize that. But it’s also not an awful movie now, either. It’s not like this is going to be the next viral movie for YouTubers to riff on. There are still moments and shots that I’m proud of, too many flashes of something promising underneath it, despite a flawed technical presentation and weak character development. And despite what this blog might read like, it’s not like we didn’t have fun making this film. In fact, I was able to put together almost an entire half hour (half the length of the movie!) of outtakes – not including the ones during the credit sequences! If you didn’t know any better watching that, you’d think it was the most fun shoot we ever did. Don’t get me wrong, it was fun, in retrospect. And I absolutely did enjoy working with the cast and crew. Aspen certainly turned in a more nuanced performance of Jamie and Aryona owned the character of PJ. Daniel delivered in spades as The Man (as usual) and everyone else did the very best they could with the direction and script they were given, especially those who were not actors and did not originally intend on even being in the film (like Dustin and Jassmine). Jamie Klotz’s Diary II is, if nothing else, a complex film. There was a lot I was trying to do and I think I may have overstretched my limitations at the time, narratively, technically and creatively. In many respects Jamie Klotz’s Diary II is merely a stepping stone in my creative progression as a filmmaker and storyteller. And knowing where the lessons its production taught me have led, I’m okay with that.